The exact origin of the Bichon Frise is unknown and it is believed to have descended from a medium sized water dog, the Barbet. The dog is believed to have originated around the Mediterranean regions. The earliest records of the breed go back to the fourteenth century, when the sailors from France brought back the dogs from the Canary Islands. 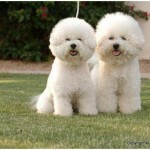 The Bichon Frise is a small breed of dogs, which has a medium structure of bones and is sturdy and compact in appearance. 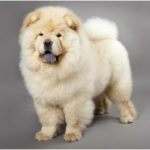 Typically, these dogs have a thick white coat, giving off the appearance of being coated with powder puff. It moves in a jaunty fashion, with its head held high while carrying the plumed tail all over its back. 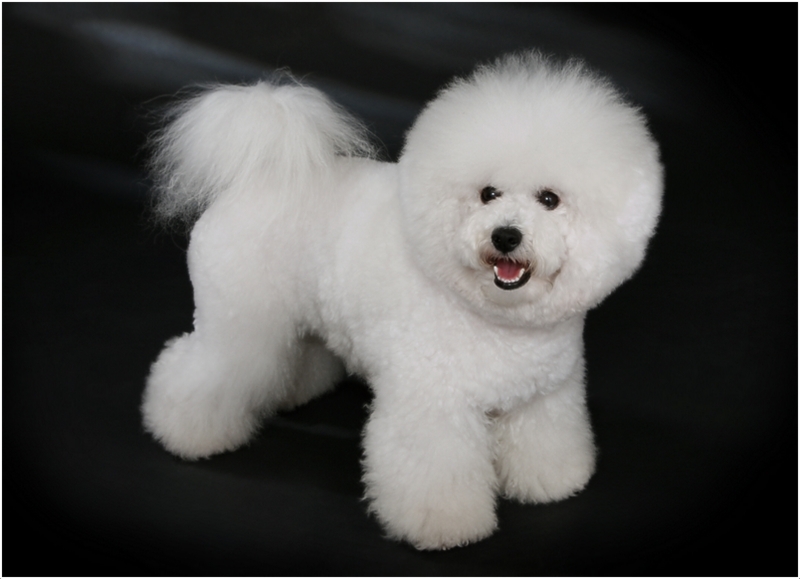 The Bichon Frise is an extremely demanding pet and requires high maintenance, regular grooming and frequent pruning. It can also very easily suffer from separation anxiety if not taken care of. This breed is not for the faint hearted. 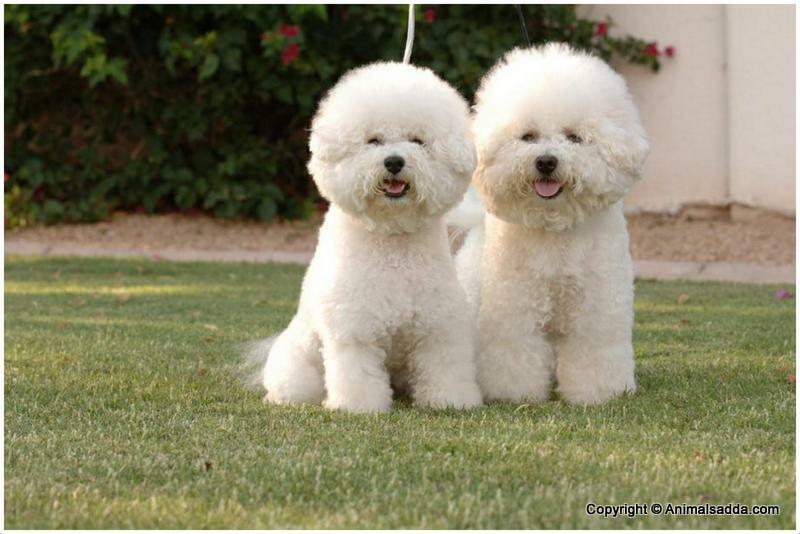 It is recommended to feed the Bichon two meals a day, consisting of high quality dry food. The amount of food should be about 1/2 – 1.5 cups, depending on the size, metabolism and activity level of the dog. 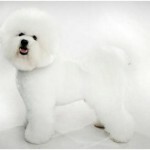 Bichon Frise prefers very cold temperatures and they are very sensitive to hot weather condition. If you live in a hot environment, air conditioners should be provided to regulate the temperature. They are suited to any kind of apartment (big or small) but you are advised to provide enough space for exercise and relaxation. 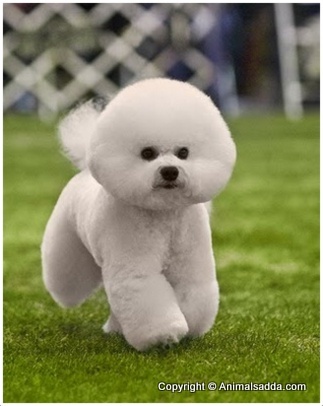 Bichon Frise will always be happy in any environment, as long as the family remains with it. 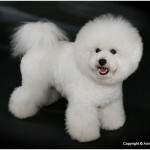 A Bichon is generally always cheerful and happy unless if he is left to himself for long periods of time. Bichons also get along very well with other animals and humans. However, they do let strangers know that they recognize a new face. They are gentle and prove to bring a smile to everybody’s face and as such, they are often used in therapy procedures in hospitals and nursing homes. 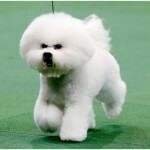 The most outstanding trait of a Bichon Frise is its cheerful attitude and personality. The dog loves being a part of the attention and is quite adept at charming and winning over people. The breed has a striking personality and loves being loved. While Bichons are independent and playful, they must not be kept in isolation as they can suffer from separation anxiety on being alone. Bichons are quick learners and can be good at dog tricks for canines. 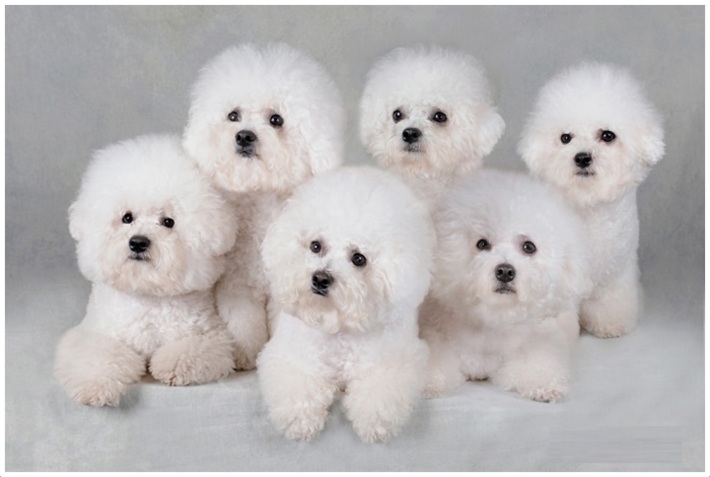 The puppy stage lasts for 6 – 18 months and Bichons learn to freely interact with their breeders and humans in general. The dogs grow rapidly in size and start to show signs of discomfort aat the adolescent stage. However, it will later learn to adapt to its new size. Furthermore, Bichons undergo high degree of exercises at the adult stage and finally at the senior stage, they tend to behave slower and die later. 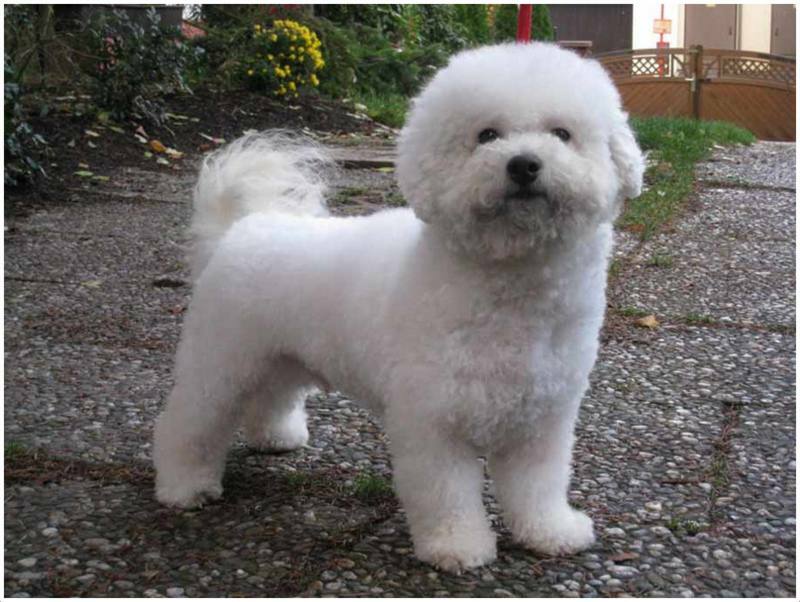 The senior stage occurs between the ages of 10 – 15 years for Bichons. 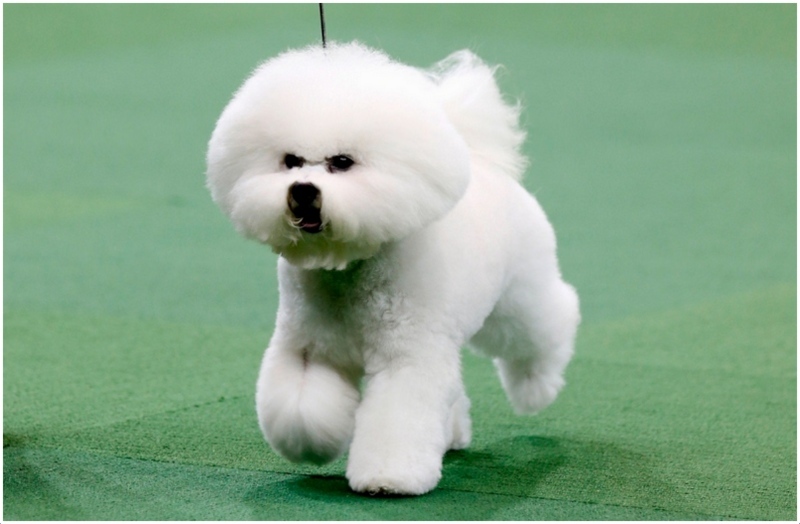 Bichons fall prey to flesh eaters like tigers and lions when they tend to roam about in their wild form. However, in their domestic form, their predators are man, disasters and diseases. Bichons are well known as active dogs. With adequate play and exercise, they do relatively well as apartment dwellers. You are therefore advised to exercise your dogs for a minimum period of 30 minutes. You should be also careful not to exercise them for long hours because they are highly sensitive to heat. When you wish to leave your house for a short period of time, ensure that you place your Bichons on crates to avoid destructive behavior. 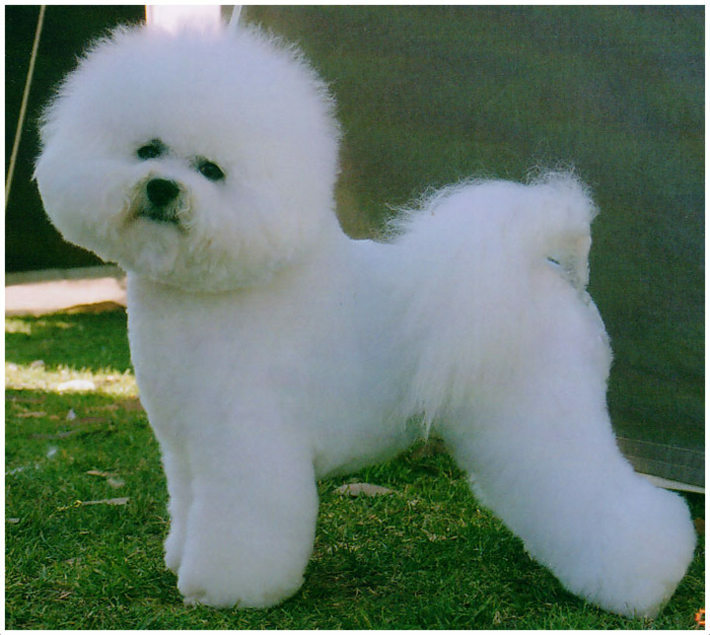 The Bichon Frise is a small and compact sized dog. 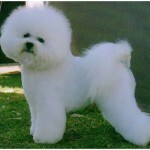 It is quite sturdy and usually has a thick white coat. The bone structure is medium and the dog has a haughty presence. 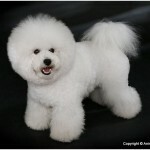 Friendly and playful, the Bichon Frise gets along with others in no time at all. 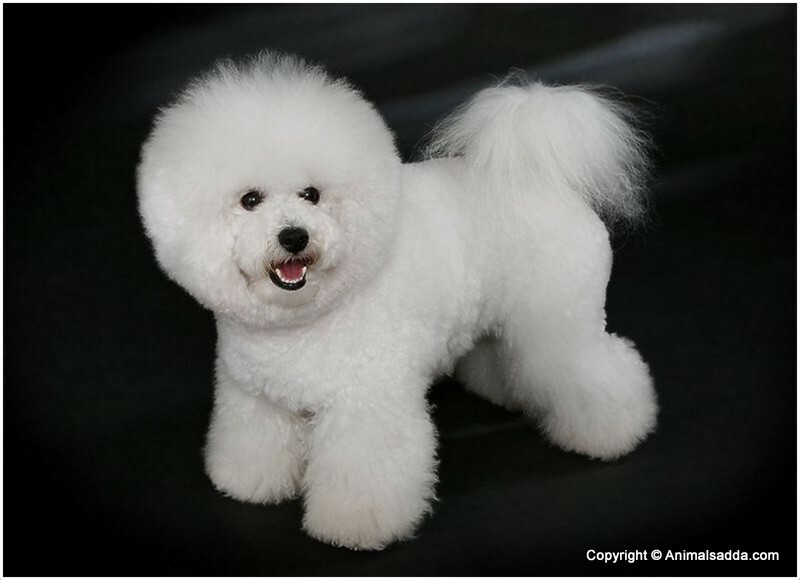 The Bichon Frise may range from 23 – 30 cm in height. The dogs may weigh anything in between 3 – 5 kg. 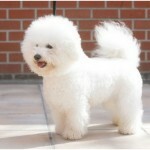 The Bichon Frise has a thick white coat and does not shed hair at all. The coat consists of a curly and coarse outercoat and a soft and dense undercoat. The feel of the coat is similar to velvet and the hairs spring back into place after patting. The coat also resembles a power puff with standing hairs. Typically, the coat color is white, but it may range in between shades of apricot white, buff white or cream white. 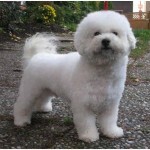 The Bichon Frise is a compact and small sized dog. Its skull is slightly rounded and it has a flat muzzle. The tail is long and curly and it has round and dark eyes and a small black nose. They undergo four stages in their lifecycle and live for an average of 12 – 15 years. 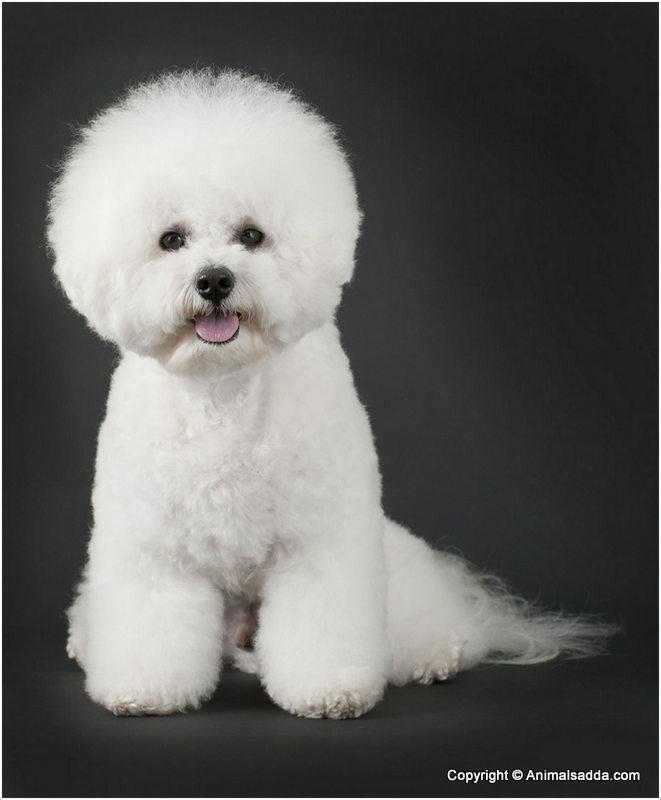 The Bichon Frise has a lifespan of 12 – 15 years. 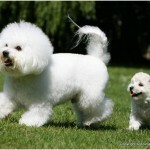 While Bichon Frises are generally healthy, they are prone to a few health problems. 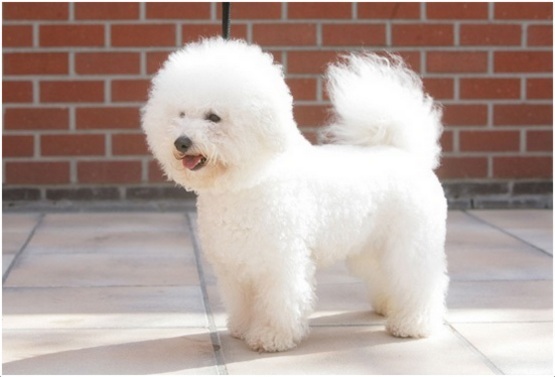 Some of the health problems that may affect a Bichon Frise include bladder problems, allergies, sensitivity to vaccinations, juvenile cataracts, hip dysplasia and patellar luxation. The Bichon Frise requires high maintenance and grooming is significantly important. The coat will need to be brushed at least twice a week and bathing will need to be done on a frequent basis in order to keep the coat clean. 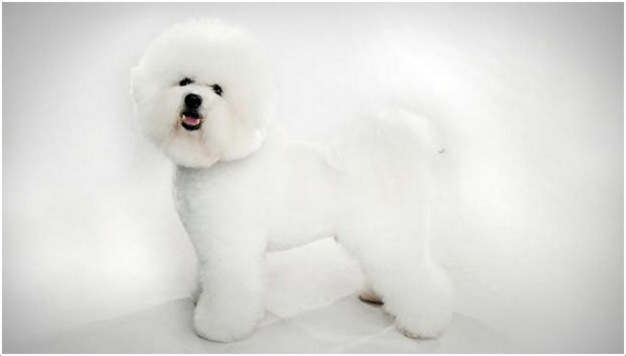 Ear wax should also be periodically cleaned off a Bichon’s ears in order to avoid infections. Many people believe that Bichons do no shed their skin. 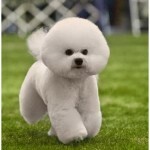 However, it may interest you to know that all animals with hair shed their skins including Bichons. 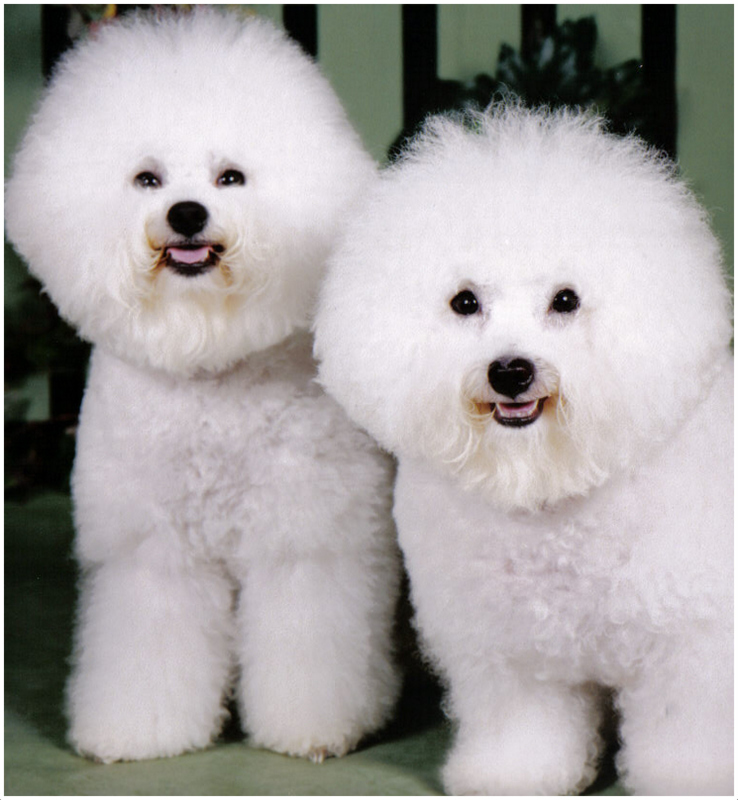 In double-coated Bichons, the shed hair is hardly visible because instead of falling to the ground, they are caught up in the undercoat. Therefore regular brushing is required to prevent the formation of tangles by the hidden shed skin which causes skin diseases. They are small-sized dogs with thick coat. They require a high level of attention and may suffer from anxiety if they do not receive proper care. They thrive in cold climates and are sensitive to heat. Generally, they always look cheerful and happy. They are highly intelligent dogs. They pass through four stages in their lifecycle. These stages are: puppy, adolescent, adult and senior stages. In their domestic form, humans, natural disasters and diseases are their predators. Bichon Frise requires social training from an early age. They have a medium bone structure. Generally, they live for 12 -15 years. 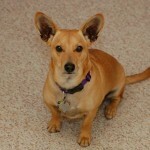 They suffer from several health challenges like allergies, bladder problems and hip dysplasia. 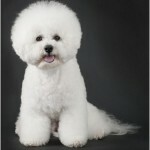 Bichon Frise requires high maintenance. Adequate grooming should be provided after shedding. Its common name is Bichon Frise. 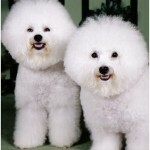 They are also called Bichon Tenerife, Purebred Bichon and Bichon apoilfrise. They originated from Belgium, France and Spain. They are small-sized species of dogs. 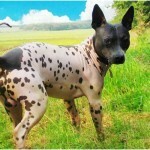 It is an example of Non-sporting dog breed group (AKC). They live for an average of 12 – 15 years. The average heights for males range from 23 – 30 cm while for females, their weights range from 23 – 80 cm. Male and female species weigh between 3 – 5 kg. They have different colors like cream and white, buff and white, white and apricot and white. 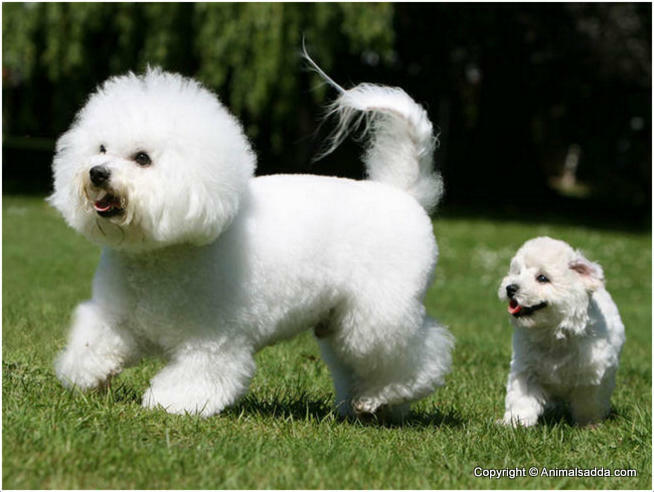 The average price of Bichon Frise puppies ranges from $450 – $600. 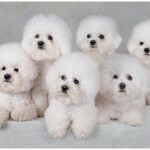 Lower classifications of Bichon Prise include: Bichon Maltese, Bichon Bolognaise, Bichon Havanese and Bichon Tenerife.